From 27-29 September 2019 the beautiful NSW South Coast town of Kiama will host the 6th Folk by the Sea Festival. You'll be joining 45 acts from all over Australia with over 100 artists and 100 concerts, dances and sessions. 2019 FOLK BY THE SEA ARTISTS CLOSED 30 MARCH 2019. VIEW THE 2018 PROGRAM TO GET A FLAVOUR OF THE FESTIVAL ! Click here to download the DL sized brochure showing all the performances times for the 2018 artists (PDF Format). Tickets for 2019 will be available 17th April 2019 enquiries call 1300 887 034. Limited camping will be available but only with the festival pass! This year Sunday events will be ticketed and will be held at the Pavillion in Kiama Showgrounds. The cost of the Sunday ticket is only $30. If you buy an Earlybird ticket you can save a whopping $30 on the gate price. FOLK by the SEA is an intimate folk festival style event featuring the sounds of folk, world, roots, Celtic, bluegrass and gypsy music over 3 days in the picturesque seaside town of Kiama, famous for its blowhole. This event replaces Folk in the Foothills which was held at the Jamberoo Valley Lodge. The event is a combination of ticket only entry (Friday and Saturday and Sunday) featuring 50 artists from overseas and all around Australia in 70 concerts at Kiama Showground in Kiama Pavillion and surrounding venues. 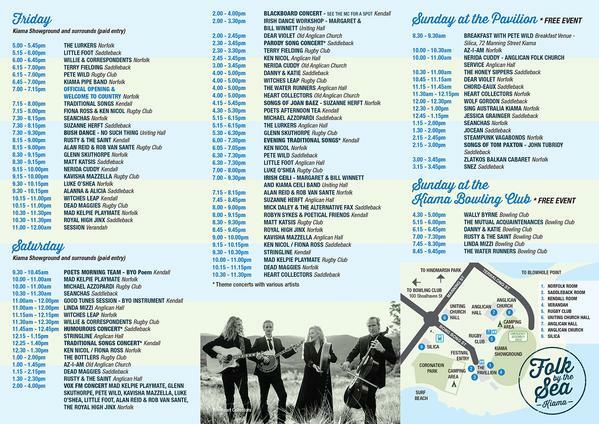 There will be 6 venues at/near Kiama Showground for the Friday , Saturday and Sunday events. Camping is available at the showground as well other quality accommodation in and around Kiama. The festival is presented by volunteers from the Illawarra Folk Club Inc. who present regular folk music concerts in the Illawarra region and the world famous Illawarra Folk Festival. Join the email list (on right) to receive regular information about Illawarra Folk Club concerts and the Illawarra Folk Festival (January 2020). Kiama is about a 2 hour drive from Sydney on the South Coast of New South Wales. Motel and hotel accommodation online enquiries to be directed through the Destination Kiama website or telephone them on 1300 654 262. Join the Illawarra Folk Club Email List to receive regular informationâ€?